Hammer and Tongs is a blacksmith located in the northern half of Skingrad. 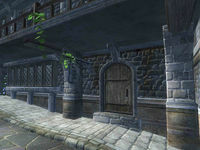 It is found next to All Things Alchemical and Rosethorn Hall and across the street from Nerastarel's House. The proprietor, Agnete the Pickled, has 1200 gold, a Mercantile skill of 80 and also offers repair services. When bartering, she will buy your armor, weapons and miscellaneous items while only selling the first two. Her wares also include the unique Helm of Ferocity, which drains your Intelligence, Willpower and Personality while fortifying your Blade, Blunt and Hand to Hand skills. The main trading room is on the ground floor and consists of a counter and large selection of Agnete's wares on display. Agnete lives upstairs, as is usual with Skingrad houses and stores. On the first floor is a locked working room and a door to a balcony, while the second consists of two bedrooms. Both beds can be freely slept in after you have picked the locks on the doors. Located next door to the Hammer and Tongs is Rosethorn Hall. If you exit Rosethorn Hall via the balcony at night time, you can jump over the railing to Hammer and Tongs. Once you are inside you can loot as you please. A full set of steel armor and some iron as well as many weapons are found in the main trading room. These could be fenced or used depending on your needs. Behind the store is a forge area containing a furnace, an anvil and a pile of coal which can be also accessed from a door on the ground floor. When the shop is closed this door isn't locked and is the easiest way inside. This page was last modified on 3 August 2017, at 12:18.